Many of the same residents who gathered at Kellogg Eye Center in late 2008 attended another meeting this month on a similar topic: The University of Michigan’s construction of a 700-space parking structure on Wall Street. 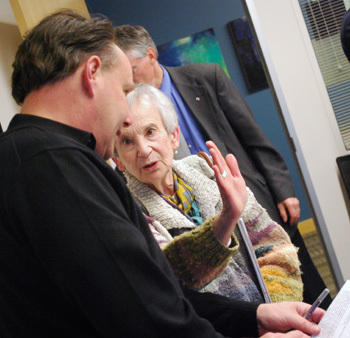 On April 26, 2012 about 15 residents heard from UM representatives about plans for the $34 million structure, which university regents approved on April 19. The purpose of the meeting was to get input from neighbors that will inform the structure’s design. Roughly 2,000 people live in that general area. They offered a lot of input, expressing concerns and giving specific suggestions related to noise pollution, traffic congestion, lighting and more. Ideas from residents included putting a green roof on the top of the structure, which will likely be at least 4-5 levels tall; placing the structure as far west on the site as possible, further away from residential buildings; making the structure pedestrian friendly; and encouraging the use of alternative transportation. Jim Kosteva, UM’s director of community relations, defended the university’s efforts in encouraging alternative transportation. And Tom Peterson, associate director of operations and support services for the UM Hospitals and Health Centers, provided details on a range of programs offered by UM in that regard – including vanpools, Zipcars, free bus service through MRide, and shuttle service from outlying parking lots. But Peterson also presented the university’s case for needing more parking at the Wall Street location, pointing to employment growth at the nearby UM medical campus. Since 2009, employment at the UM medical school and hospital complex has grown from about 19,000 to nearly 21,000 employees. Even more staff will be added when a major renovation of the former Mott children’s hospital is completed, he said. The Wall Street parking project was revived after the university pulled out of the proposed Fuller Road Station in February. The joint effort with the city of Ann Arbor would have included a 1,000-space parking structure and, some hoped, an eventual train depot. When asked about it at Thursday’s meeting, Kosteva said the university still shares the city’s vision for that Fuller Road site as a good location for intermodal transportation. When the city receives the federal support it needs for this project, he added, the university is prepared to be re-engaged about its potential role. 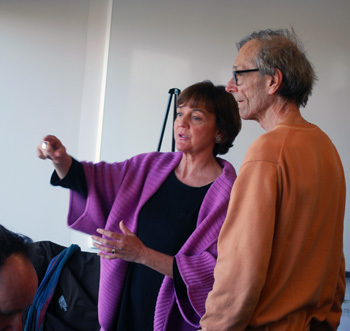 The bulk of the 90-minute meeting focused on design aspects of the Wall Street structure, in a discussion led by university planner Sue Gott. Several people pointed to the city’s Fourth & Washington parking structure as a model. Wall Street resident Elizabeth Colvin said she refers to it as the “Sue Gott parking structure,” because of Gott’s instrumental role in soliciting public input that helped shape the design. At the time, Gott worked for JJR and was a consultant on that project. Gott, who grew up in Ann Arbor, replied by saying she knew UM had to deliver something that was worthy of this city, and something they can all be proud of. 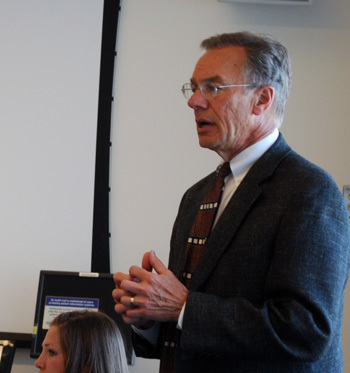 Near the start of the April 26 meeting, Tom Peterson – associate director of operations and support services for the UM Hospitals and Health Centers – gave an overview of the health system to provide some context for the Wall Street parking project. “We’re in a growth mode,” he said. In-patient beds have increased about 20% over the past five years, from 848 to 1,009. In addition to in-patient care, the university opened a medical observation unit in 2008 with 18 short-term, out-patient beds. In 2010, the hospital did something similar for its surgical observation unit, adding 13 beds. In 2011, a major expansion of the emergency room added 27 treatment bays, Peterson reported. Over the past 8-10 years, the hospital has added 18 operating rooms and expanded its diagnostic imaging services. These are just a few of the obvious signs of growth, he said. Tom Peterson, associate director of operations and support services for the UM Hospitals and Health Centers, talks to residents about the growth in employment and patient services at the UM medical complex, which is driving the need for more parking. In the background are Paul Green of the Broadway Neighborhood Association and Sabra Briere, Ward 1 city councilmember who lives on Broadway. The next activity that will spur additional growth is the $163 million renovation of the former C.S. Mott Children’s Hospital, which was approved by UM regents at their April 19, 2012 meeting. The new C. S. Mott Children’s and Von Voigtlander Women’s Hospital opened late last year. The renovation project, to be completed in two years, will add another 120 beds, mostly for neuroscience patients. Hundreds of employees will be hired for that facility, Peterson said. In 2009, the UM medical school and hospital complex employed about 19,000 people. Today, there are nearly 21,000 employees. “That’s pretty significant employment growth,” Peterson said. With that growth comes demand for parking, he said, but the university hasn’t simply been adding on-site parking. The UM has been promoting alternative transportation approaches, too, he said. About 570 employees use a vanpool program, for example, and the university hopes to expand that number. The MRide program began in 2004, allowing faculty, students and staff of the university to board AATA buses without paying a fare. The cost for the service is paid by UM to the AATA, and fiscal year 2011 was a record-setting year for the program, with 2.43 million rides taken. In another partnership with AATA, the university is subsidizing express routes between Ann Arbor and Chelsea, and Ann Arbor and Canton. Peterson noted that he’s one of the people featured in AATA’s ad campaign, and he’s happy to support public transportation. The university joined the Zipcar car-sharing program in 2006, and now over 3,000 people have signed up to use the system’s 21 cars in Ann Arbor. UM’s GreenRide website was launched to help people find alternative transportation options, Peterson said. Through that, 23 new car pools and 19 vanpools have been started. In addition, the university has also expanded its off-site parking, Peterson said. In 2010, following the acquisition of the former Pfizer facility – now called the North Campus Research Complex (NCRC) – about 300 spaces were added to the parking system. Last year, another 265 spaces were opened at an adjacent lot. That’s a temporary solution, however, because employment at NCRC is expected to grow, he said. A UM lot on Glazier Way has been expanded by about 100 spaces. And the university added a medical express bus service between outlots and the medical campus, as well as a research link bus between NCRC and the biomedical engineering building to the medical campus. Peterson concluded by saying that UM is trying to deal with the transportation issue in many ways. They have limited land, so they’re taking a blended approach. To some extent, it does include additional parking spaces. 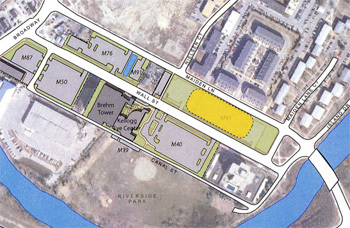 In 2006, the Ann Street lot was opened, adding about 525 spots. In 2007, about 450 spaces were added in a structure at the Cardiovascular Center, including about 200 spots for staff. But when the new Mott Children’s Hospital opened last year, UM converted about 300 former employee spaces for use by patients and visitors. There are multiple ways that the university is addressing its parking needs, he said. Ray Detter, a community activist and chair of the city’s Downtown Area Citizens Advisory Council, noted that part of the university’s previous plan had focused on building the roughly 1,000-space Fuller Road Station. For many, Detter said, it had been a preferable alternative to building a parking structure on Wall Street. His understanding was that the project was suspended but not necessarily cancelled, and he asked for clarification of that. Jim Kosteva replied by briefly recapping the history of Fuller Road Station, noting that the project had been “paused” this February. [See Chronicle coverage: "UM, Ann Arbor Halt Fuller Road Project"] The university had been trying to address the demand for parking prior to 2008 with its Wall Street parking project, Kosteva said, but suspended that effort when UM staff began talking with the city about the possible joint project on Fuller Road. By way of additional background, university staff held a neighborhood meeting in December 2008 about the possibility of constructing an office building, parking structure and transit center on Wall Street, just down the street from UM’s Kellogg Eye Center. That $48.6 million project, which had been approved by regents at their September 2008 meeting, was met with considerable resistance from neighbors. But at another meeting in January 2009, city staff and some councilmembers met with Wall Street area residents and talked about the city’s relationship with the university, both on that parking project and more broadly. At the time, city planners said the university was proceeding on parallel tracks with both the Wall Street parking structure and possible interest in a Fuller Road transit station. 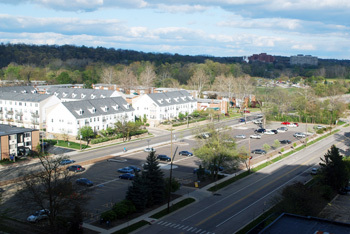 Then at a June 2009 meeting of the UM regents, Tim Slottow, the university’s chief financial officer, reported that UM’s purchase of the former Pfizer property resulted in enough additional parking spaces to meet their demands for the medical campus at that time. Slottow also indicated that he was encouraged by talks that the university was having with the city of Ann Arbor about a possible transit station on Fuller Road. Those two factors resulted in the university putting the Wall Street parking project on hold. Jim Kosteva, UM's director of community relations. Fuller Road Station moved ahead, and a memorandum of understanding between the university and city was signed in November 2009 that laid out the responsibilities for shared costs, a timetable for completion and other details. [.pdf of memorandum of understanding] The MOU called for the estimated $46.55 million project to be shared between UM and the city in proportion to the number of parking spaces available to each (78% and 22 % respectively), making the university’s share of the project an estimated $36.309 million. The target date for completing the parking structure piece of the project was June 15, 2012. Regents formally authorized the project at their January 2010 meeting. A site plan was designed and received approval from the Ann Arbor city planning commission – on a 7-2 vote – in Sept. 21, 2010, but the plan was never moved forward to the city council for consideration. At the April 26, 2012 neighborhood meeting, Kosteva told residents that it became clear that the city couldn’t meet its level of participation and timetable as outlined in the MOU, and in February the project was halted. However, he said, the university still shares the city’s vision for that Fuller Road site as a good location for intermodal transportation. UM officials are hopeful and supportive of the city’s efforts to gain the federal funding it needs to realize that vision, he said. When the city receives the federal support it needs for this project, he added, the university is prepared to be re-engaged about its potential role. But given the needs of UM employees, Kosteva said, the university had to address those real demands for parking. That’s why regents were asked to authorize this Wall Street parking project, he concluded. Future Plans for Wall Street: Even More Parking? Sabra Briere, a Ward 1 city councilmember who lives in that neighborhood, noted that the plan doesn’t specify the size of the parking structures. But she recalled that the last plan had included two 600-space structures, plus an office building. Tim Mortimer, president of the Riverside Park Place Condominium Association, said he’d also seen the 2005 master plan, and he asked Kosteva if residents should expect a second structure in the future. That’s what the master plan reflects, Kosteva replied, adding that employment would be the driver for future parking needs. Mortimer said there’s a general recognition that the leadership of UM hasn’t done a good job in educating its staff about the need for alternative transportation or off-site parking to minimize the impact on the neighborhood. UM leaders don’t have the courage to tell staff that if they don’t want to accommodate a sustainable, environmentally sensitive approach to transportation, they can work somewhere else. Tim Mortimer, president of the Riverside Park Place Condominium Association's board of directors. UM officials like to refer to the university as the Harvard of the Midwest, Mortimer noted. In terms of environmental sustainability and design, it’s actually more like the Southeast New Jersey Junior College of the Midwest, he contended. The neighbors hope that someone can exert some kind of leadership that will result in less need for parking in the area. Kosteva responded, saying that the alternatives outlined by Tom Peterson earlier in the meeting did demonstrate leadership. A wide variety of transportation alternatives are provided to employees, he said, and there is strong financial encouragement as well. While Kosteva said he appreciated that there’s room for improvement, the objective is to continue to support these alternatives. Kosteva said it was that kind of leadership that caused UM to get involved in Fuller Road Station, and the university continues to try to support that vision. Another structure would be the worst of both worlds, Mortimer said. It would require people to drive in to the structure, then take a shuttle to get to their final destination. Peterson told Mortimer that he heard and understood those concerns, but that he also hears from UM employees that there’s not enough parking. The hospital leadership has consistently told its employees to “get over it,” Peterson added – there will never be enough parking for every employee. The university needs a blended approach, he said. Brenda Giers, who lives in the only remaining single-family home on Wall Street – owned by her brother-in-law, Harry Hawkins of West Hawk Industries – said she worried about what would happen to her home. She said she feels like she’s in the middle of nowhere, and is worried because she’s retired. If the university bought the house it would put her in a jam, she said. Kosteva noted that development of the Wall Street area has been in the university’s master plan since 1988. Yet the university has never aggressively sought to acquire property, he said. When individual property owners approach UM indicating a willingness to sell, the university makes an offer, Kosteva said. As long as Giers’ brother-in-law doesn’t want to sell, he added, the university can’t buy that property. 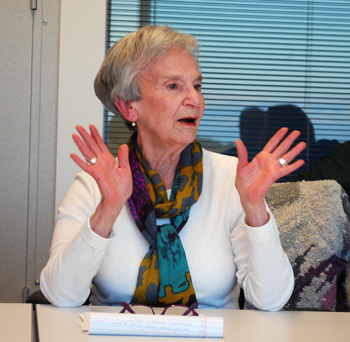 Sue Gott, university planner for UM, led the discussion to solicit input on the parking structure’s design. She began by noting that the regental authorization had been given just a week ago, at the regents’ April 19 meeting. The staff thought it would be best to meet with neighbors early in the process, she said, but the challenge is that there’s no design work to share yet. Gott displayed the graphic of the area that had been shown to the regents, and said she wanted to get input from the residents before they launch into the design. Doug Koepsell of the university architect’s office was on hand to record input from the evening, Gott said, and that input would inform the site’s design. One consideration is the importance of maintaining pedestrian circulation, she said. In the past, there had been a strong desire to have street trees, she noted, so one possibility is to have street trees as a buffer between the sidewalk and Maiden Lane. That might make sense along the Wall Street side, too, she said. There will likely be space at the east and west ends of the site that could be used for stormwater management, but also for green space that could be used by residents, she said. Perhaps people would like to have benches or some other kind of seating there. These are the kind of things they were hoping to get feedback on, she said. Later in the meeting, the project’s architect – Neil Martin of the S/L/A/M Collaborative (Stecker Labau Arneill McManus) – described his initial thoughts on the structure. He talked about inspirations from the neighborhood and the university, including the historic DTE building on Broadway, with its warm brick and mortar, and Hill Auditorium, designed by Albert Kahn. The thing that’s striking is the sense of craft that these buildings display, he said. He hopes to bring that sense of craft to the parking structure, too. In part it will involve selecting the right kind of brick, he said. Martin also talked about the scale of the project, saying it was his mission to create a structure that doesn’t feel enormous and that is pedestrian friendly. It was important to design a building that doesn’t look like a parking structure, he said, and to make the rhythm of the building pleasing both from the perspective of people walking down from the bridge over the Huron River, as well as for people walking close to the structure. Throughout the meeting there were a wide range of suggestions and issues raised by residents and addressed by Gott and Martin. The following report presents a summary of that discussion, organized by topic. Randall Jacob, who lives on Jones Drive, asked about the status of a cluster of mature trees at the east end of the site. Gott replied that a tree assessment will be conducted to look at the types, health and quality of the trees there, but she couldn’t guarantee that all would be saved. Tim Mortimer noted that to the east of that tree cluster is a small area of city parkland with a path running through it to primarily handle pedestrian flow, he said. It might be nice to have an adjacent green area between there and the parking structure for people to sit or play Frisbee or use for things other than a walkthrough, he said. Looking down from a 7th floor meeting room in the Kellogg Eye Center, a view of the parking lot on Wall Street where the new 700-space parking structure will be built. In the right foreground is Wall Street. Parallel to Wall Street on the left is Maiden Lane. The white buildings are the Nielsen Square condominiums. Gott replied that this was useful feedback, and that the UM staff also will be talking to staff at the city – including parks planner Amy Kuras – about what kinds of features might contribute to the neighborhood experience. City councilmember Sabra Briere said she hoped the designers would think of a creative use for the top of the structure, so that it doesn’t become a major heat source. She observed that some cities have made parking structures with green roofs, but that hasn’t happened in Ann Arbor. Gott replied that UM’s parking structure at the Cardiovascular Center has a green roof. A green roof would address several issues, Jim Koli observed. It would help with stormwater management, make it visually more pleasing, and eliminate the need to plow. He suggested asking people at UM’s School of Natural Resources and Environment for advice. One resident requested a good mix of evergreens and shade trees, noting that shade trees “turn into sticks” for six months each year. Gott said evergreens are used selectively, because of security concerns – such trees can become hiding places. Eliana Moya-Raggio suggested that instead of having green areas on each end of the structure, the building could be pushed to the west and have a larger green space on the east end, closer to the majority of residents. Gott said they’d look at placing the structure as far west as possible. Christine Crockett, president of the Old Fourth Ward Association, urged UM to use flowering trees in the landscaping. “Bloomerang” lilacs, for example, will flower throughout the season and are salt resistant, she said. Crockett hoped the landscaping wouldn’t just be stark, green and boring. “I hope you let your color sense get carried away,” she said. Tim Mortimer urged the design to allow for pedestrian paths and crosswalks all the way from the Nielsen Square condos across Maiden Lane, Wall Street, Canal Street and into Riverside Park. He indicated that if they had to choose, the residents of Nielsen Square would likely prefer a tree buffer on the north side of the parking structure, rather than a sidewalk. Gott said the design would aim for both, but she noted that Maiden Lane is relatively narrow, so that might be a factor. Elizabeth Colvin pointed out that there’s quite a bit of pedestrian traffic on both sides of Maiden Lane. A resident of Long Shore Drive observed that many people walk their dogs along that stretch, heading to Island Park. It would be great if there were green areas for dogs to take “breaks,” she said – and a trash can would be nice, too. Sabra Briere, who lives on Broadway and represents Ward 1 residents on city council, said she’s heard concerns from residents about noise pollution from a new parking structure. Lighting systems make a constant noise, as do air circulation systems. It would add yet another “major hum” to a neighborhood that already has a lot of other major hums, she said. Briere hoped that designers would think about mitigating that kind of noise, as well as the noise from the cars themselves. Later in the meeting, Briere observed that in the past, there has been a difference between the city’s ordinances and the university’s expectations for construction projects on UM property. She asked that UM not schedule the arrival of trucks or the start of construction before 7 a.m. under any circumstances, and that the work be concluded at a reasonable time at night. It’s important for residents to have the ability to enjoy the outdoors in their neighborhoods, she said. Kittie Morelock, who lives on Wall Street, noted that speed bumps within the structure also cause noise when vehicles hit them, and she asked that speed bumps not be included. She also said that snow removal on the surface lots was already loud, with the beeping of trucks as they back up. Sometimes the work takes place between 2-6 a.m., and is very disruptive. Any way to mitigate that noise – especially at the top of the structure – would be good for the community of 2,000 people who live in the area, she said. Several comments focused on the already-congested Maiden Lane traffic, and the impact that bringing in an additional 500 vehicles will have. Sue Gott reported that a traffic study will be conducted before the structure is built. They’ll look at the number of employees that will be working in Wall Street buildings, as well as how many will be walking to the hospital or taking a shuttle. Not all of the traffic will be new, she noted – although the structure is planned for 700 spaces, it’s a net increase of 500 spaces. 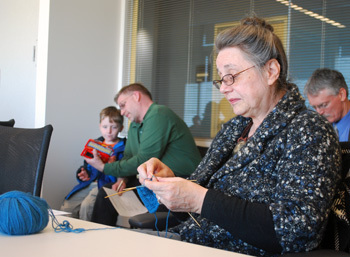 Ward 1 city councilmember Sabra Briere was knitting socks. Behind her to the left is Jim Koli, owner of Northside Grill, with his son Josh. Behind Briere to the right is Doug Koepsell of the university architect's office. Tim Mortimer suggested placing entrances and egresses toward the west side of the structure, away from the more residential areas. He also wondered if it would be possible to accommodate shuttles within the parking site, rather than having them idling on the street. Gott said they could look into that, although they’re hoping to keep the footprint tight so that it doesn’t become a huge, long structure. It’s a balancing act, she said. 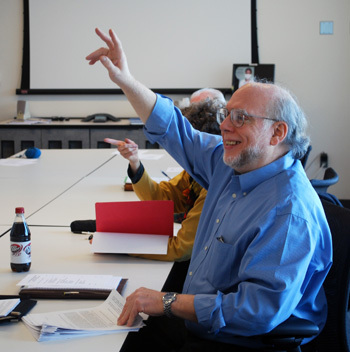 Ken Koral noted that Wall Street is primarily used by UM employees, while Maiden Lane is the real traffic corridor, leading directly to the bridge over the Huron River. He suggested it might be better to put the entrances and egresses to the structure on the Wall Street side, with possibly a new traffic light at Broadway and Wall Street. Elizabeth Colvin, who lives in the Nielsen Square condos facing Maiden Lane, said there are already a lot of vehicles that idle on that street, including school buses and AATA buses. It’s very stop-and-go, she said, and she hoped that the design would keep that issue in mind. Mortimer suggested shooting a video from the vantage point of the meeting room they were in – on the 7th floor of the Kellogg Eye Center, overlooking the parking lot. They could learn a lot about traffic flow from that, he said. Jim Koli pointed out that four years ago when this project was initially being discussed, it was noted that Wall Street is wider than Maiden Lane because the original bridge across the Huron River was at Wall Street. The bridge was later moved to Maiden Lane, bringing more traffic to that narrower street. Now, 500 additional cars might be dumped onto Maiden Lane, he said. Perhaps putting an entrance/exit from the structure onto Wall Street, on the side closest to the bridge, would help ease the traffic onto Maiden Lane, he suggested. Mortimer noted that there are residents on that east end who wouldn’t be happy about that strategy. Kosteva suggested then perhaps the entrance could be at the west end of the structure, away from residences and closer to the Kellogg Eye Center. Brenda Giers, who lives in a single-family home on Wall Street, stressed the need for adequate street lights. Gott replied that designers are sensitive to lighting issues, including concerns about light spilling into the neighborhood from cars at the structure. There are also safety and security concerns about the need for adequate lighting within the structure. There could be motion-sensitive controls in the structure that would dim the lighting if no one is there, she said, but that would turn brighter when cars or people move through. The design will also be sensitive to the need for pedestrian lighting outside the structure so that people will feel safe, Gott said, while trying to keep light contained on the site. Paul Green of the Broadway Neighborhood Association asked what the range of levels might be for the structure – how tall would it be? There was some reluctance to speculate. The architect, Neil Martin, said they hadn’t figured it out yet, but it would likely be in the range of 4-5 stories. Sue Gott added that it will depend in part on the footprint. If they keep the structure on a smaller footprint, it would need to be taller. Ray Detter noted that there’s been a lot of discussion in Ann Arbor about public art. He felt that generally, the university does a better job at this than the city, so he hoped it would be an element of the parking structure. Detter said the area had an interesting history, and he indicated a willingness to explore adding markers there. Gott said now would be the time to start talking about that, so the university could possibly provide a backdrop for that. 2. Afford special consideration to the experience of pedestrians walking along the structure’s perimeter. If at all possible: Avoid completely blank walls at the street level; make sidewalks sufficiently wide to accommodate two-way traffic comfortably; include pedestrian comfort as a criterion for building setback. Incorporate devices that animate the street frontage and provide visual interest. 3. Arrange vehicular entrances and access control points to permit sufficient stacking of arriving vehicles within the structure to avoid back-ups into the street during peak arrival times. 4. Locate the vehicular entrances and exits to utilize the existing Maiden Lane/Nielsen Court intersection to the maximum extent feasible to minimize the impact of traffic on adjoining residential uses and to minimize vehicle idling time. 5. Accommodate shuttle bus service at the west end of the structure, and manage the service to minimize bus idling on site. 6. Minimize the structure’s total size relative to its desired capacity by incorporating smaller stall spaces for a substantial portion of the parking capacity. 7. Design the structure to be LEED certified at least to the Gold level. 8. Design and select lighting to minimize glare and other impacts on homes in the area. (Example: High pressure sodium lighting is very harsh.) Minimize the light shining laterally away from the structure and off the top of the structure towards local homes. 9. Include a roof or screening on the top floor to minimize the eyesore of open parking when viewed from taller buildings in the area (both residential and Kellogg). 10. Minimize noise projected by infrastructural elements (transformers, light ballasts, fans, etc.) through optimal selection, placing, mounting and muffling of components. 11. Locate the structure as far as possible to the west to enable the open land east of the structure and adjacent to a small, existing area of city parkland to be as large as possible. Neil Martin of S/L/A/M, the project’s architect, told Mortimer that the notes were helpful and that he agreed with many of the suggestions. University planner Sue Gott talks to Ken Koral, a resident of the nearby Broadway neighborhood, about the proposed parking structure on Wall Street. They are overlooking the current surface lot from a meeting room on the 7th floor of UM's Kellogg Eye Center. Sabra Briere echoed those comments, saying that some people want to park at Fourth & Washington even though other structures might be closer to their destination. They like the way it feels to enter that structure, even though there are complaints about the tight turns between levels, she said. The stairwells are clean, and it’s not viewed as a hostile environment – compared to other structures like Ann Ashley or Fourth & William. Even people who generally hate parking structures don’t hate the one at Fourth & Washington, Briere said. Kittie Morelock described it as a calm, quiet presence. Colvin noted that a design of that kind would result in allies for the Wall Street structure. Tim Mortimer joked that they shouldn’t make it too attractive, because they wouldn’t want to entice more people to use it. Gott responded by saying that Fourth & Washington’s design resulted from the kind of community discussion that she wanted to have with residents for the Wall Street project, too. It was a discussion that was specific about aspirations for the building. There are many subtle cues in the Fourth & Washington structure that contribute to how people experience it, she said. Gott recalled that Christine Crockett, at a previous meeting years ago, had used the term “humanity” to describe a design concept, and that word had resonated with her. Gott talked about how others in the room were influencing her approach too. She said she goes back years with Ken Koral, who lives on Broadway and has attended neighborhood meetings for other projects, advocating for the university to honor the experiences of neighbors. And Ray Detter “is like my conscience,” Gott said – she knows she has to deliver something that’s worthy of Ann Arbor. Residents want to see something great happen on Wall Street, Gott said, and that’s why she and others involved in the project want to listen and work with them. There are obviously limitations, she added – they have to work within their budget. But the university wants to do something that’s great. Neil Martin was chosen as the architect on the team because they want to do a design that’s contextual to the neighborhood, appropriate, and something that they can all be proud of, she said. Koral referred to Martin’s desire to incorporate aspects of existing buildings, and noted that there’s a hodge-podge of design in the neighborhood. He said it sounded like Martin was set on using brick, but there might be other materials that would better integrate. Fourth & Washington, which has a brick exterior, is a good design for its location, Koral said, but might not be the best choice for Wall Street. Mortimer noted that some of the nearby buildings, like the Riverside Park Place condominiums, aren’t exactly models of good design to emulate. Eliana Moya-Raggio, a resident of Wall Street. Paul Green observed that since many of the questions related to how the structure would look, residents should simply take a photo of a structure that they like, and send it to the designers. “It’s easy to do,” he said. Tom Peterson pointed to a parking structure on the campus of Michigan State University, on Grand River Avenue, that does a good job of integrating the older architecture on that campus. Eliana Moya-Raggio noted that parking structures are inherently dead spaces, so anything that can be done to enliven the building would be welcome. Because the university is not building on campus, but is building in a neighborhood, they need to listen to residents and incorporate feedback as much as possible. “I think it’s our right,” she said. Sabra Briere raised a question that she characterized as a short-term issue. When construction on the site begins, 200 parking spaces will be temporarily displaced. Already she routinely gets complaints from people who live nearby because some UM employees park all day at Island Park, along Traver Road, or in the free spaces near the Amtrak station. She wondered where the people will park who currently use the Wall Street surface lot. Steve Dolen, executive director of UM parking and transportation services, said that when new patient parking is completed next to the Kellogg Eye Center, that will open up more spaces at a nearby lot for employees. They are also planning to use shuttles to north campus, and encourage alternative modes of transportation. He told Briere that this was the first time he’d heard about employees parking at Island Park or along Traver Road. 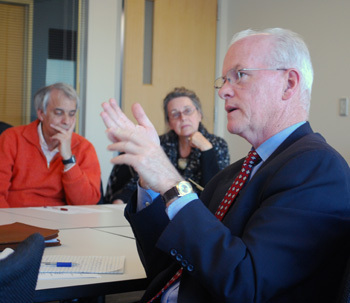 Tom Peterson noted that there is still excess parking capacity at the North Campus Research Complex (NCRC) – the former Pfizer site. About 200 spaces are unused there, and some people from the Wall Street lot will likely migrate there. Briere observed that because parking in the neighborhood is free and no residential parking permits are required, employees tend to like that option. She regularly sees people wearing scrubs walking toward the UM medical center, and when she asks them, they are very comfortable telling her where they park. The fact that UM employees park all day at city parks is not something she views with pleasure, Briere said. Jim Koli added that since the city added parking meters along Wall Street, some of the more “frugal” UM employees have taken to parking in the neighborhood where there are no meters. Eliana Moya-Raggio asked when residents can expect to be included in the process. Gott promised that there would be more meetings, as soon as they determine the design schedule. Meetings with neighbors would typically occur through the design and construction process, Gott said. The Chronicle could not survive without regular voluntary subscriptions to support our coverage of public bodies like the University of Michigan. Since you’re already parked in front of a computer, click this link for details: Subscribe to The Chronicle. And if you’re already supporting us, please encourage your friends, neighbors and colleagues to support The Chronicle, too! The University is quick to claim they encourage alternative transportation, and will even throw money at things like the Chelsea bus if it means they don’t have to actually change anything on the Ann Arbor campus. But let’s examine the record. 1. The main entrance to the Hospital faces away from town. It couldn’t be any farther away without actually being in the river. There is almost no bike parking by the entrance, and what’s there isn’t covered. There is no bike parking at the Emergency entrance, or at most of the other entrances. There is a small amount at the back door of the Med Inn but it’s on the side of a hill and not covered. It’s not at all obvious how to walk to the hospital from town, and if you do manage it, you’ll end up at a back door with no reception desk that’s locked at night. 2. A year after the Pfizer purchase you still couldn’t walk or bike conveniently between there and neighboring North Campus. 3. The Cardiovascular Center was built without bike parking. After I badgered them for a year they finally put in about three spaces, again not covered. 4. Palmer Commons and Life Science were built with about six short-term bike spaces, not covered. 5. 50 years after North Campus was started, there still is no good way to walk or bike there. 6. Unlike the City, which allows bike parking anywhere that it isn’t in the way, the University impounds any bikes not in a bike rack. Which wouldn’t be so bad if they weren’t so stingy with bike parking. 7. The University continues to move operations out of town. Arbor Lakes, Wolverine Tower, NCRC, and even Turner Geriatrics are all in places that are hostile to pedestrians and bicyclists. 8. The University bus system is actually not too bad. But it doesn’t connect well with AATA. There is no direct bus from downtown to North Campus, Arbor Lakes, Wolverine Tower, or Turner Geriatrics. 9. While North Campus is fairly walkable, there are few amenities there. The nearest group of bars, shops, and restaurants is at the top of the hill on Plymouth, in a pedestrian/bike hostile strip mall. Jim: I work on North Campus. I don’t bike to work, but I know people who do, who use Plymouth and Fuller and are satisfied. How could that be improved, in your opinion? I *do* take the AATA bus home from NC fairly often. The 1, 2, and 3 all serve various parts of it. Not sure what the problem is there. As for walking/biking between NC and NCRC, *shrug*. There’s all kinds of work to be done with NCRC. It was a huge acquisition and it’s going to take some time to digest. I can’t blame the U for not making bike connections the highest priority. Nevertheless, there *is* a pedestrian/bike connection between Hubbard and NCRC, a fairly recent one, I guess. North Campus is somewhat sequestered by design. The lack of “amenities” is something we all grumble about, but short of putting a strip mall on campus, I’m not sure what else to do. There are at least seven places to get food on campus and two convenience-ish stores that I can think of–not fine dining, admittedly, but it’s not the wasteland it once was. I’d be curious to hear your recommendations. Re the article: I’m curious about the status of the old Kroger shopping center parcel. Is there anyone looking at a project there or is it completely in limbo? It seems like that will ultimately be the biggest factor in the livability and walkability of Lower Town. I don’t believe it is correct to say that the UM “subsidizes” the Chelsea Express. It pays part of its employees’ fares on that bus. That is not the same as helping to pay for its operation. Ann Arbor taxpayers (who do not include the UM) pay for that. I take it the point there is that the UM’s payments in connection with the commuter service are tied to and limited by the number of employees who use the service, whereas AATA uses local millage money to cover the gap between revenues and expenses – whatever that amount might turn out to be. So here’s what it turns out to be. Revenues for commuter express for the first half of FY 2012 (through March) showed $54,138 in passenger fares (some portion of which UM paid) and $42,313 in state operating assistance for a total of $96,451. Expenses for commuter express over that period were $138,053, leaving a total of $41,602 that was covered by Ann Arbor taxpayers. About 15 or 16 years ago, I regularly biked from North Campus (family housing) to Central Campus. Other than the fact that it’s uphill both ways :-), it wasn’t that much worse than biking from the OWS to Central Campus in terms of traffic. Re 2: None of those buses are what I would call direct. If I leave Blake tomorrow morning at 10:00 for NCC, the 1, which goes by way of Dhu Varren, will take 46 minutes including a 18 minute wait. The 2 will take 30 minutes including a 11 minute walk. The 3 will take 33 minutes including a 18 minute wait and 7 minute walk. Even if these were good options, the University can hardly take credit for them. Re: “There’s all kinds of work to be done with NCRC. It was a huge acquisition and it’s going to take some time to digest.” Exactly. When you have a big job to do, you order the to-do list by priority. The top priorities, like vehicular access and parking, get done right away, before the facility even opens. Lower priorities get done later. Things that are considered completely unimportant, like the pedestrian connection, aren’t even on the list, and don’t get done until someone complains. Any claims by the University that they encourage alternative transportation are a blatant deception. In terms of the University’s non-motorized transportation plan, what contributions, if any, has the University made to the border-to-border trail? The Arb for example has little connectivity to the border-to-border trail, unless you count illegally crossing the railroad tracks.